YEEEEEEHOOOOOOOO…after like more then half month of hard work, I have already finished the DIY leather bucket bag, and here you are the tutorial! I would say this bag is a beginner level, not require many skills but you do need quite a lot of tools like eyelets setting dies, but it’s okay if you don’t wanna invest a lot in tools, you can pick those eyelets with screw-back or even just stitch around the eyelet to secure it. Just I made it part-time and needa take steps pictures (and main reason is I am quite lazy), so it took me more then two weeks to finish; otherwise I think you can finish it in a weekend. For the inspiration, check out here and for the paper pattern, check out here. 1. Cut all the patterns out from leather and pig split. 2. Join leather and lining wrong side to wrong side by glue. 3. Polish the leather edge by sandpaper. 5. You can see the difference between stained edge and untreated edge. Quality tells by details. 6. Sand the seam allowance by 200-400 grit sandpaper, which makes a rougher surface to have a better bond with glue. 7. Gouge a sewing channel. 8. Place the main bodies side by side. 9. Join the top protruding part. Punch stitching holes by diamond stitching chisel. 10. Use a 2-prongs chisel to punch holes for corner. Hand-stitch it. 11. Install D-ring to the side panel. Fold end until completely hide the protruding part. 12. Gouge a sewing channel, punch stitching holes on the side panel. 14. Cut 4 corners on the bottom part of the main bodies, in order to form shape and join the bag base easier. 15. Sand the seam allowance by 200-400 grit sandpaper, which makes a rougher surface to have a better bond with glue. 16. Fold the seam allowance, glue the main body and the bag base. Use binder clips to clamp them together. 18. Punch holes for the eyelets. My hole punch is 9mm diameter. 19. Set eyelets with setting dies. If you don’t have these tools, you can choose the eyelets with screw-back or simply have a stitch around eyelet to secure it. 20. Lace the strap, make a stopper for the strap. The stopper is just a rectangular pattern, size varies from the diameter of your strap, and mine is 2.5cm x 5cm. FINISHED! 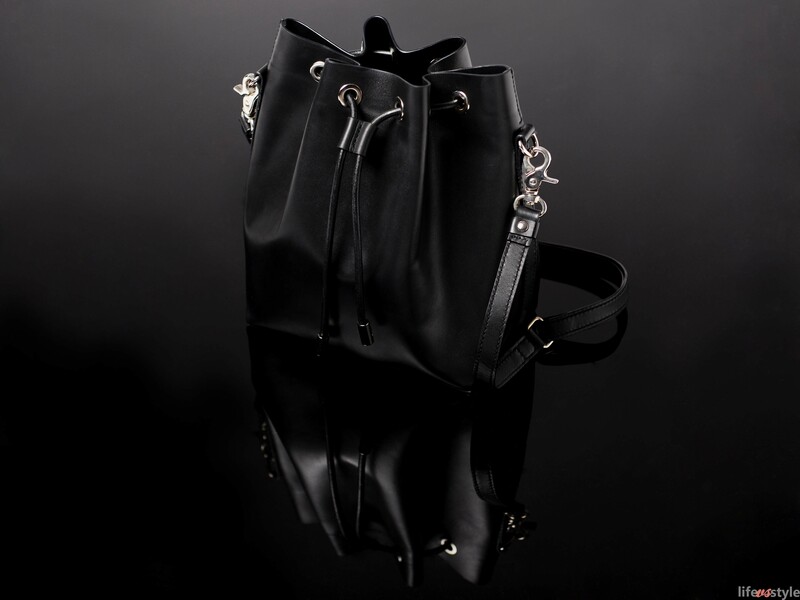 ROCK YOUR NEW BAG! You are a genious is the strap a lease are how is the strap made did I miss something? Oh my goodness, this is amazing! What a terrific DIY! Wow honey this is IMPRESSIVE!!! Amazing craftsmanship, I can see this baby selling for hundreds in store! Oman, bookmarking your blog now, great stuff from you! Amazing tutorial! The bag looks so great! UHHHHHHmazing!! I’m going to have to make this one day!